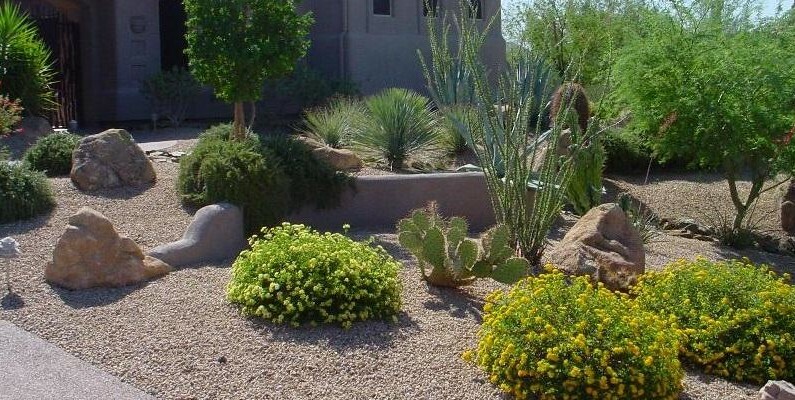 Get beauty and benefits from your Phoenix, Arizona landscaping today. Nothing sets off your home like a professional landscaping. Your house is very becoming properly framed with beautiful shrubs, trees and perennial flowers. In Phoenix, Arizona landscaping this means you will want to be sure that you hire a talented and skilled landscape company to create your landscape design. Not just everyone is familiar with those desert plants and easy to adapt to the Arizona valley climate that will thrive and remain handsome for many years to come. Homeowners in this area have relied on the people at Desert Crest, LLC to plan and do landscape installation of superior quality for almost 20 years. We know that your home landscaping and outdoor living rooms should provide you with many benefits. A lovely entrance to greet both you and your guests begins at the curb and must look wonderful twelve months a year. Our Phoenix, Arizona landscaping clients enjoy their outdoor living areas of the courtyard and patio all through the year. At Desert Crest, we can create cool shade beneath a custom built ramada and sparkling water fountains or waterfalls to enhance your desert lifestyle. Stone paving is very popular with our customers in Phoenix. Arizona landscaping design for desert xeriscaping and adobe architecture are the perfect partners with natural stone sidewalks or patios and paver stones driveways. In the shaded, walled courtyard softened with beautiful Arizona plants around the flagging stone floor adds to reduced heat and secluded ambiance. We offer both xeriscape design with artistic use of rock and stone or lush green lawns installation, depending on your neighborhood requirements and personal choice. For your brand new home or an older home remodel, our designers will assist you in selecting the perfect solution for enhancing both your yard and your lifestyle. Because the climate is perfect for spending a great deal of time outdoors year around in Phoenix, you will find a lot of lifestyle enhancement with a landscape design that features outdoor living rooms on the patio. At Desert Crest, we can create beautiful outdoor BBQ islands to full outdoor kitchens that add a lot of style to entertaining and time with family. A focal point of water feature babbling merrily along is a wonderful partner to the benefit of dancing flames in your outdoor fireplace. Such a well appointed patio outdoor living area is where you, your family and friends will quickly gravitate to first. The perfect yard of your dreams begins with your initial consultation with our professional landscape designers.